(Phys.org) -- A Sandia National Laboratories technology has been used to remove radioactive material from more than 43 million gallons of contaminated wastewater at Japans damaged Fukushima Daiichi nuclear power plant. Sandia researchers had worked around the clock following the March 2011 disaster to show the technology worked in seawater, which was pumped in to cool the plants towers. UOP LLC, a Honeywell company, late last year renegotiated its license of the Sandia technology being used at Fukushima. The revised license makes UOP the exclusive U.S. manufacturer of crystalline silico-titanate, or CST, a molecular sieve that can separate highly volatile elements from radioactive wastewater. The late Sandia chemist Bob Dosch and Texas A&M chemical engineering professor Ray Anthony were leaders of the team that developed CSTs in the early 1990s response to a need for materials to remove radioactive contaminants from wastewater. 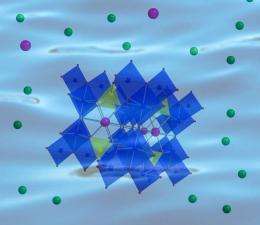 They found that a certain class of synthetic zeolite is more effective in capturing some radioactive elements, like cesium, than other technologies. They created CSTs: inorganic, molecularly engineered ion exchangers that can be sized specifically for cesium and other elements. When high-level radioactive elements are removed from contaminated water with CSTs, the remaining lower-level radioactive waste can be treated in a more economical and less hazardous way. UOP worked with Sandia through a Cooperative Research & Development Agreement (CRADA) to produce a commercial-scale manufacturing procedure for the CSTs. We developed a technology to bind the material into a beaded form so it could be used in ion exchange columns, said Dennis Fennelly, UOP marketing manager. The company licensed and began commercializing the technology in 1994. It was one of the first licenses issued by Sandia, which had begun its tech transfer program just a year earlier. In 1996, the CST work by Sandia, Texas A&M and UOP won an R&D 100 Award, often termed the Oscars of technological innovation. UOP, based in Des Plaines, Ill., with locations around the world, is an international supplier and licensor of process technology, catalysts, adsorbents, process plants and consulting services to the petroleum refining, petrochemical and gas processing industries. With the Sandia license in hand, UOP developed CST products to remove radioactive ions from liquids such as radioactive waste streams, alkaline tank waste and spent fuel storage pool water. The products are part of the UOP IONSIV Selective Media line and were first aimed at government facilities that produce nuclear weapons materials and at commercial nuclear power plants. CSTs came to mind when the Fukushima Daiichi nuclear power plant outside Tokyo was damaged in an earthquake and tsunami on March 11, 2011. But nobody knew whether the technology worked in seawater. UOP, which was in contact with Sandia and doing its own tests, came to the same conclusion. The company asked to renegotiate its license with Sandia to become the exclusive manufacturer of CSTs. At the same time, UOP also began looking at expanding its water treatment product line to industrial and commercial applications. He said the marketplace is changing in the wake of the Fukushima disaster. UOP manufactures CSTs at its plant in Mobile, Ala. Toshiba Corp., Shaw Global Services LLC and AVANTech Inc. use CSTs in their Simplified Active Water Retrieve and Recovery System (SARRY). The SARRY system has been in operation at Fukushima since last fall and continues to successfully reduce radioactive cesium to nondetectable levels, UOP said. Rigali and Fennelly said Sandia and UOP plan to continue their R&D work around other types of radioactive and industrial water treatment materials. We are exploring collaborative opportunities with specialty materials and technologies Sandia has developed in the 15 years since we initiated our collaboration with UOP in the mid-90s, Rigali said. The two CST patents are held jointly by Sandia and Texas A&M, which share the licensing royalties, and run through 2013 and 2017. The UOP license will continue until 2017 when the last of the two patents expires, Thayer said. She said the license with UOP is not just one of Sandias earliest, but is among a handful from that period still in active use. Its a long-term commercial relationship, she said. Nenoff said the CST work had special meaning for her since she came to Sandia 18 years ago to work specifically on these materials. She helped in the development of the CSTs and other novel molecular sieves for defense legacy waste cleanup of tanks at the Hanford Site in Washington.